Theoretical yield is how much product you can make with given reactants. 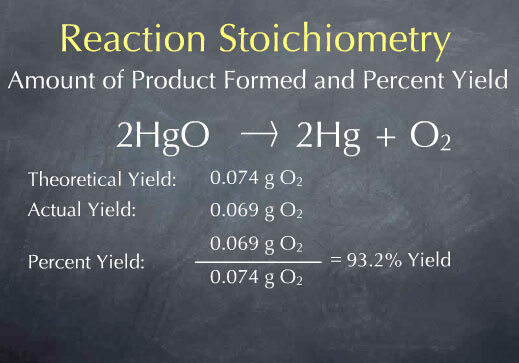 To determine theoretical yield, do a normal stoichiometry calculation. Actual yield is how much is actually produced when the reaction is performed. Percent yield is how well you do. Percent yield calculates how close to the theoretical yield you are. A high percent yield means that your actual yield was close to the theoretical yield, the reaction worked the way it was supposed to it, and it was efficient and accurate. Why doesn't theoretical yield equal actual yield very often? ERROR! Error can include impure substances, uncalibrated equipment, improper procedure... all kinds of things. Percent error measures the amount of error. Small percent error means things went well and the actual yield was close to the theoretical yield. Percent yield plus percent error should equal 100.